"I hate the playground" said the woman as she sat back down on the low wall. "Me too" I replied, shaking my head as I plucked a squirming toddler off the top of the slide. The very nice woman had just leaped up to grab Sam, who had decided that at twenty months it is perfectly safe to balance at the top of a slide designed for four-year-olds. I was very close by but unfortunately of no use as I was at the top of the nearby climbing thingy, rescuing Emmie who had reached the highest point but couldn't get down. 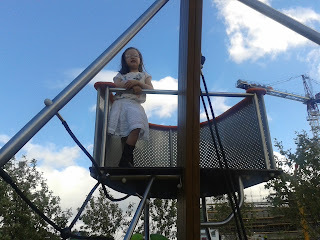 I wouldn't mind only we were in what is possibly the smallest playground in Dublin - there are only three "things" altogether - a slide, a climbing contraption and a pirate ship. The playground is enclosed by a high fence and is no bigger than a garden. There really is no safer, more confined place to go. Yet two of my three kids had managed to get themselves into difficulty simultaneously. I really don't love playgrounds. The helpful woman and I exchanged knowing looks and were bonded momentarily by our mutual lack of affection for our surroundings. Or is it an open-secret, like not loving doing homework? A case in point - queueing for the swings. This is very stressful. Are we in the right spot? Does the mother who just arrived on the other side know that we were here first? What will I do if she doesn't realise and goes to put her kid on the swing? Am I letting my kids down if I say nothing? Am I being over-the-top if I say "sorry we've been waiting for our turn"? Aghhh I really don't like playground unwritten rules - in fact I wish someone would just write them down. What to do when your toddler hits another child for no reason? How to react then another child is "mean" to one of years? I'm not great on the confrontational stuff, in fact I can pretty much only deal with children who are the same age as or younger than my own kids. And there's no way I'm confronting a parent. So I just cross my fingers that nobody kicks my children. 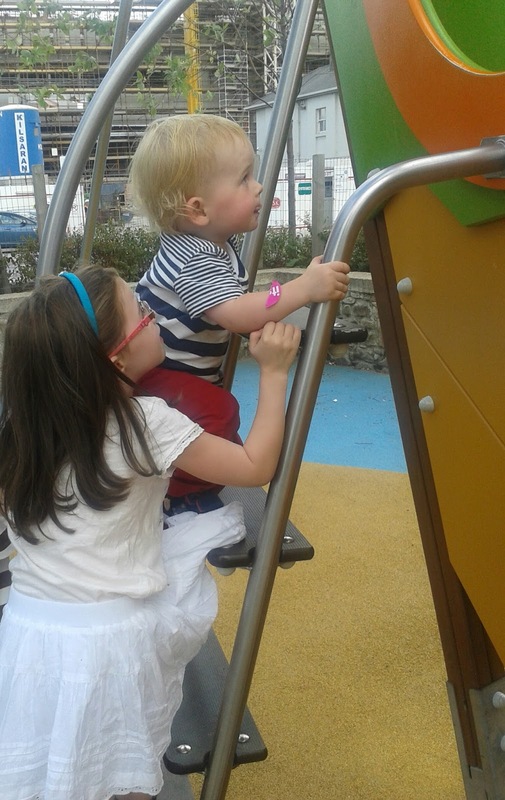 It's Ireland, so it's often cold and grey and dull at the playground. If it was constantly hot and sunny, I would happily spend all day there, soaking up the rays while the kids play. I am actually a much better parent when it's sunny. But sadly that's not how it works. For parents there is a lot of chasing, catching, wrestling, wrenching, queueing, pushing, holding and rescuing. It's not relaxing. Kids never, ever want to leave when it's time to go. I have never heard children say "Ok mum, sure, race you to the car" when they're told time is up. This is a universal truth of playgrounds. So parents beg and plead in a most unbecoming manner, trying to wheedle their children into coming home without resorting to outright bribes or threats on front of other parents. At least for the first seven or eight requests to leave, after which, all bets are off. And there is nobody to talk to. Unless your toddler tries a swan dive off a slide and you get to bond with his rescuer. Might try that again actually.